Thank you for including me on your mailing list for your ezine! I'm finding lots of valuable information on it. I've been reading the selling on eBay article and checking out other machine quilters on eBay. I have to admit, I'm very leery about listing there. Most of the longarmers I've talked to have told me that I'd be giving my work away. If you look at my website, you'll see that I'm reasonably priced for my part of the country/state. I honestly don't know what to do; I want more business but not at the cost of making a decent living. I think you're absolutely right about selling your longarm quilting services on eBay – you're not going to get the price you deserve for your work, and in some cases, the experience will not be worth the time as some people who purchase on eBay have expectations way beyond the prices they pay. Sign up for Google Local Business Center: This is a service that Google offers business owners so that their business shows up in searches when someone types in a location. You may have noticed these local business results when you've done a search on Google as they are at the top of the search results with a map and a listing of businesses near the area. So, if you search for “machine quilting business maybrook, ny” you would show up at the top with the map. It's not an issue for most of your top keyword phrases, but you could also start showing up when someone types in “quilting maybrook, ny”. And, it certainly can't hurt with your Google rankings. Work On Your Website: I like your website, but perhaps you can reorganize a bit to make sure that you direct visitors to do exactly what you want them to do – either request a quote for some quilting, order quilting, or order a custom quilt. Make the choices obvious. Maybe have a large button on the home page that says “Request a Quote” and another for “Custom Quilting” so that people's eyes are drawn to what you want to highlight. Also, you might want to consider some introductory text on the home page that talks about your service and gives the brief description of why you're special. Get Some Testimonials: From the gallery on your site, it looks like you have some very happy customers. You should ask them to write you a quick testimonial. If they are a little concerned about writing, then you can call them on the phone, ask them what they would say in a testimonial, and then write it down yourself. Always send them a copy of the testimonial for final approval. Not only is it polite, it also ensures you are covered as testimonials are an area where marketers must be very careful about only using actual customer testimonials – faking can get you into a LOT of trouble. Try Working with the Local Newspaper: If you have a local or regional newspaper, try to contact the business editor to convince them to do a story about your business. You will want to create some kind of “hook” – an angle for the story that is bigger than just a profile of your business. For example, I do some work with a local band, and the paper here in our area was pitched a story about the band around the hook of four successful business people who are making music at night and loving it. Perhaps you've done some charity quilting or have an interesting story about a cherished quilt from your childhood. Get In Touch with Local Quilt Shops: It appears there are a number of quilting-related businesses in your area (thank you Google Local Business Search! ), so you should take some time and go in and introduce yourself. Ask if you can leave some business cards or even some small brochures (many word processing programs will have templates for tri-fold brochures you can print on your inkjet printer or bring to the local copy shop). If you present yourself well, you may be able to get referrals from them. You can even expand your reach beyond your travel area by searching for shops a little outside of your range and creating a nice postal mailing, followed up a few days later with a phone call. Some other quick ideas would be to get involved with any quilting guilds or organizations in your area for networking (and hand out lots of business cards), network at quilt shows and craft fairs (and perhaps even sell some smaller quilted items to help pay for your time), or even hold a quick continuing education class on some aspect of quilting to help expose your business to other quilters. Good luck with your business, and please let me know if you have any other questions. Marketing is one of the areas that many small businesses take for granted. When you go into business, you tend to focus on the product or service you're delivering, instead of attracting customers. But, in order to succeed, you need marketing to drive a steady stream of prospects to you business and help convert visitors to customers. I have recently launched a new web site that might help. 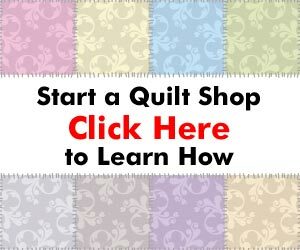 The Fabric Stash Club offers FREE classified ads for anything quilting related. There is a section on the site for listing quilting services such as Eileen’s. There is a small fee for this type of ad but until the end of the year, you get a 90 day ad for the price of a 30 day ad. She could advertise her business for 90 days for $10.00! I am working on placing ads in the major quilting magazines in their next issues to drive more business to the site. Take a look at the site and tell me what you think. All great ideas. Another way to get business to come to you is to write articles for local quilt shop newsletters. Many of them have online or print newsletters and the shop owners should be thrilled to get some extra content. Don’t forget your Quilt Guilds – they are a great source of customers and sometimes offer advertising at a very minimal cost in their monthly newsletters.